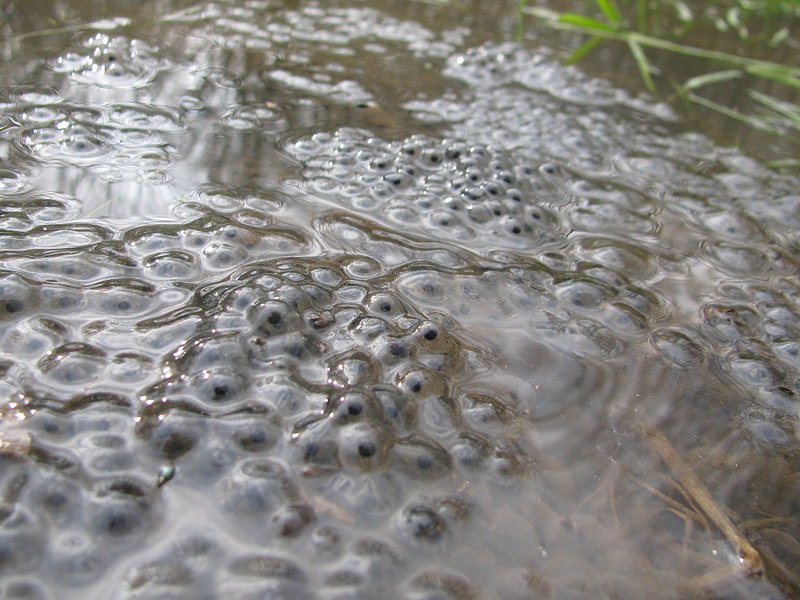 Frog spawn. Approx 100 batches in Roe's Well 28th February 2007. Frog spawn batches in Roe's Well 28th February 2007. FROG SPAWN in the lake 23.3.05. It appears as a gelatinous mass. Individual eggs can be distinguished. Frogspawn present in Bomb crater pond 11th March 2017. Photo © Brian Ecott. Unfortunately the bomb crater normally dries up before development is complete. 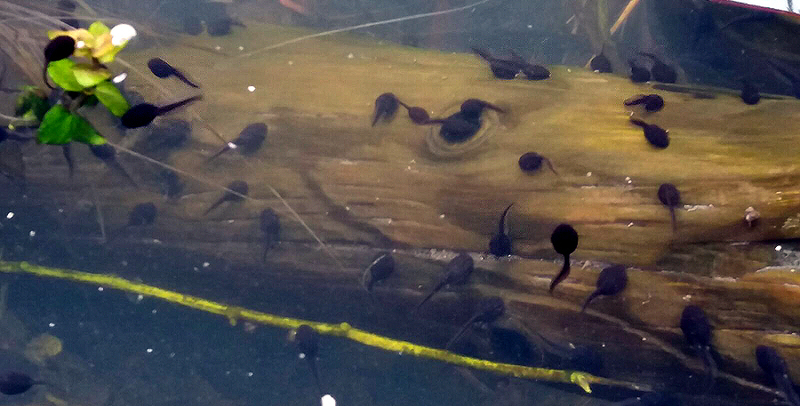 Frogspawn was found earlier in the week at Roes Well..
Tadpoles grazing algae - a green film on a piece of wood in the lake. 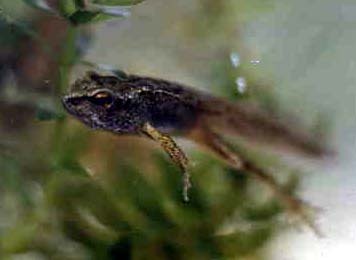 Tadpoles become carnivores later when they start to grow their limbs. 30th April 2017. Photo © Martin Bell. A large bird of prey has eaten a female frog and discarded the oviducts and egg mass on the grassland behind the lake. 25th Feb 2007. Middle: FROG TADPOLE showing almost complete development. 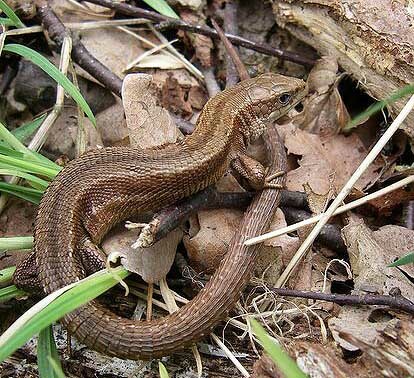 The legs are present, and the tail will be absorbed. 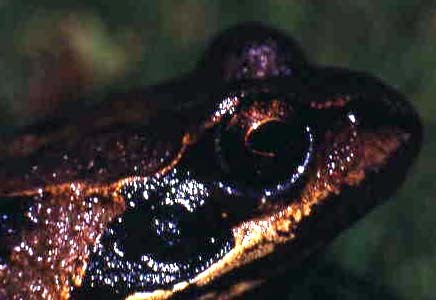 Right: COMMON FROG Rana temporaria is distinguished from the toad by its smooth skin and a circular ear drum behind the eye. The adults will return to the pond at the age of 4-5. 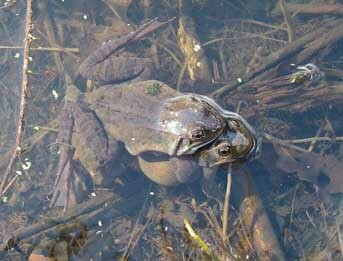 Left: COMMON TOAD Bufo bufo pair in amplexus. The male is the smaller. 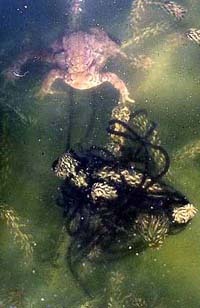 Strings of toad spawn in the lake 31st March 2006. 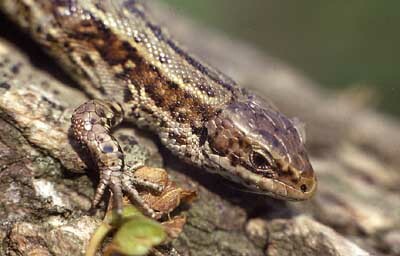 Pictures show the feathery external gills. 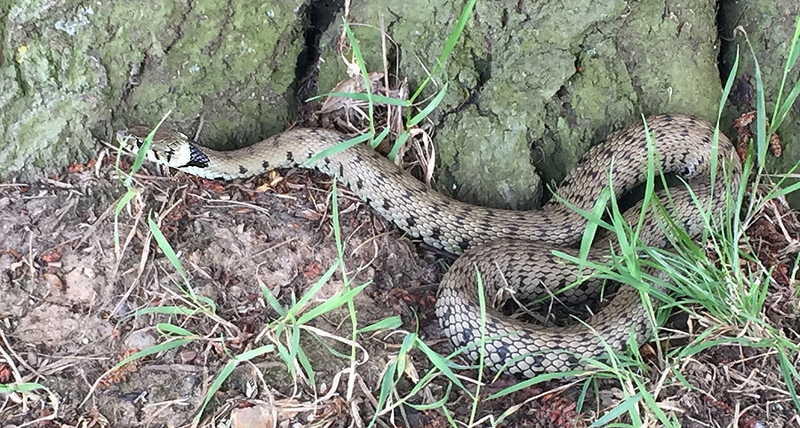 Martin Bell photographed this harmless grass snake near the farmyard. They have been swimming in the lake. Their food is plentiful at this time as many young froglets are beginning to leave the water to spend 4 or 5 years growing and reaching maturity before returning to the water. 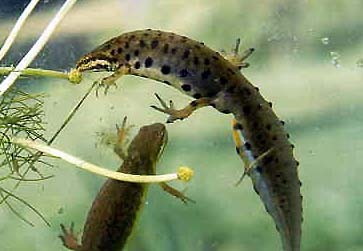 Few of the masses of tadpoles survive predation, particularly in the early stages. Photo © Martin Bell 2nd June 2017. 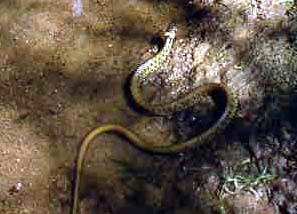 Occasionally seen in the forest ponds and craters, also in the Golf course ponds. 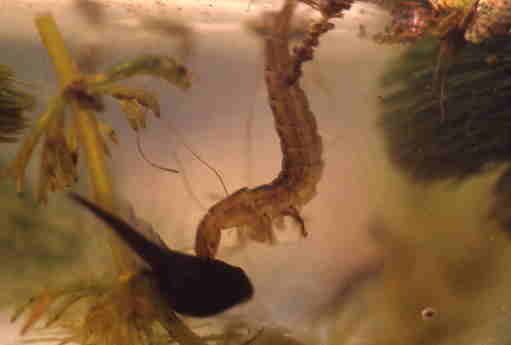 Feed principally on frogs but take tadpoles, fish, newts and insects. 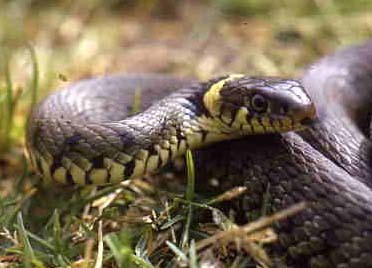 GRASS SNAKE Natrix natrix on the heathland. Photo: 4th Sept. 06. Photo: June 1971 on the heathland.